Michio (Kyoko Fukada) is 30-years-old. She keeps looking for a job after her previous employer went bankrupt, but she is unable to find work. Michio still supports her younger boyfriend and her savings is almost gone. Then, Michio meets her ex-boss Ayumu (Dean Fujioka). She was scared of Ayumu when they worked together. Ayumu now runs a tearoom which his grandmother ran. Michio decides to work part-time at Ayumu's tearoom. There, she various troubles everyday. Ayumu helps Michio, which allows her to see a different side of him that she never noticed before. Based on manga series "Dame na Watashi ni Koishite Kudasai" by Aya Nakahara (first published May, 2013 in Japanese josei manga magazine You). Inoue Mar 19 2018 9:49 pm Love this drama wished they would play it twice a week. It so cute!! lemon Aug 14 2016 5:32 pm Just finished this drama in a half day marathon. Can't believe it is awesome. Entertaining and cute! Fleng May 07 2016 7:42 am Thanks Waku Waku Japan for bringing this drama to Singapore! Loving it. Kyoko Fukada still got it! Awesomw drama. Rere Apr 30 2016 3:57 am LOL. Me too. I watched the first episode on Waku Waku Japan and currently watching the 6th episode on Internet. I love this drama so much..
Andechii Apr 30 2016 12:08 am I just watched episode 1 at Waku waku Japan and fall in love right away! Can't wait to watch the whole series. Finally, a dose of dorama after waves of kdrama. So excited!!!! lila Apr 18 2016 7:51 am if i'm not wrong the song's name is もっと（motto) by aiko :) it becomes my fav song after watching this series. fifi.gaia Apr 17 2016 2:28 pm Anyone know what is the slow-romantic song in this drama? Cannot find any names anywhere! Pageant Fan Mar 14 2016 3:00 pm So nice to see Mr Japan 2013 Takayuki Suzuki in the show with Fukakyon and Dean. Quirky and heartfelt show for sure. Pageant Fan Mar 14 2016 1:56 pm Interesting show. So fun to see Mr Japan 2013 Takayuki, Fukakyon and Dean in the show. Quiky fun loving. Alya Feb 10 2016 1:09 pm I <3 this drama. dororochan Feb 01 2016 6:53 am OMG OMG OMG !!! Dean Fujioka is so handsome and adorable here!!! Can't stop giggling while watching him and shibata bickering, it's so cute!!! chibiko2000 Jan 15 2016 2:50 pm I was so excited for this drama. I love all the cast. I love how they make it reality manga and I like it not too comical because I don't want to see them overact on everything. Can't wait to see the next episode. Faye Jan 14 2016 10:26 am Watched 1st episode. A iittle bit boring in the beginning because it lacks comedy. Though on the next part, I started to see some cute action from Kurosawa and finally decided to watch the next episode. I think the two main leads depicted the manga characters so much, except that Fukada is lacking comical expression. 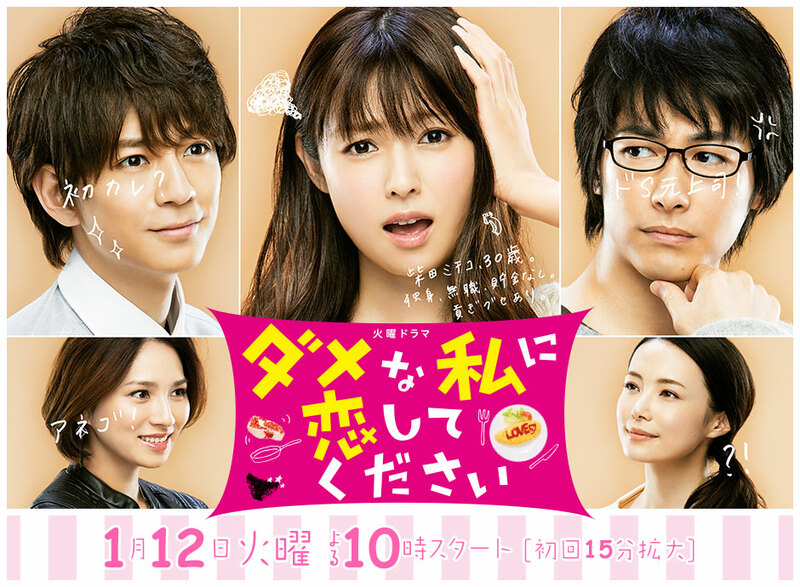 Overall, a so-so dorama with easy theme. The story follows its manga properly, but I hope it won't become boring halfway like From 5 to 9.
nananoyo Dec 17 2015 6:07 pm oh god now I'm hyped, I absolutely LOVE the manga and I love Nakahara~ About the female lead...well let's wait for official teasers or promo pics. Hope there will be any. Wahhh, how did I only find out about it now and just by accident?! Cheese in the Trap and Dame na Watashi ni Koishite Kudasai starting the same month? Best. January. Ever. dororochan Nov 18 2015 7:33 am i've read the manga, though it is still ongoing, but so far the story got me hooked! really looking forward to this! !